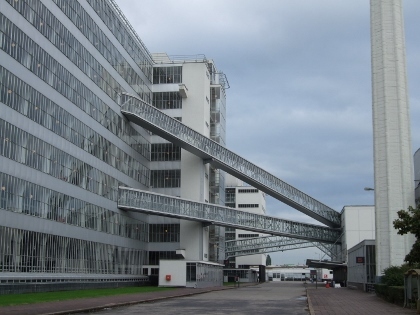 The Van Nellefabriek is an industrial complex that has become an icon of Modernism and symbolizes the commercial history of the international trade port of Rotterdam. Designed in the late 1920s as an 'Ideal Factory', its main components are steel and glass to create an environment of light, air and space. The complex lies on the banks of a canal. The former factory was used for the processing, packaging and dispatching of transported goods coming from all over the world. There are three main building at the sites: the tobacco factory, tea factory and coffee factory, plus a series of smaller functional buildings. The buildings were designed by architect Leendert van der Vlugt from the Brinkman & Van der Vlugt office in cooperation with civil engineer J.G. Wiebenga, at that time a specialist for constructions in reinforced concrete, and built between 1925 and 1931. 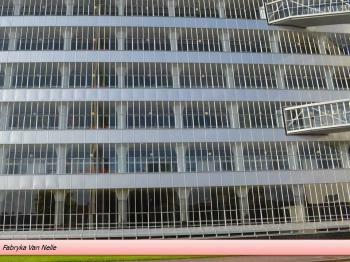 It is an example of Nieuwe Bouwen, modern architecture in the Netherlands. It was commissioned by the co-owner of the Van Nelle company, Kees van der Leeuw, on behalf of the owners. 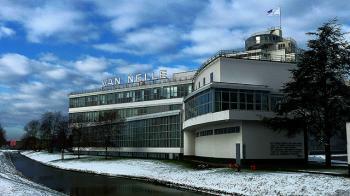 The Van Nelle Factory is the number 1 landmark of the Modern Movement in Architecture in the Netherlands. 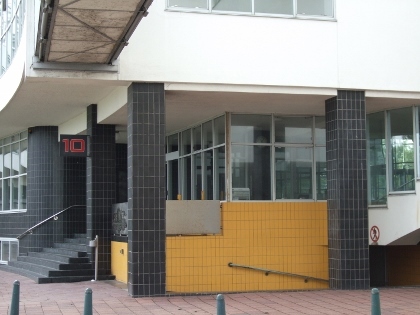 It is located in Rotterdam and was built between 1925 and 1931. The factory used to produce tea, coffee and tobacco. Its huge floor space is now rented out to offices. I visited it on Open Monuments Day 2011 (September 10th). During the rest of the year it is pretty difficult to get in, except when you're prepared to fork out 100 EUR for an exclusive group tour. The factory complex is very large. Nowadays it is only one of many industrial buildings at this location. But when it was constructed, it occupied a large spot in a pristine polder landscape. There was plenty of space for the architects to deliver all ideas, including sport fields and a garden for the factory workers. Architecture students guide the tours around the complex. A group of about 20 interested persons had already shown up a little after 10 in the morning. Among them there even was a fellow world heritage spotter, Peter, who was so clever to recognize me! The first part of the tour covered the outside of the complex. Here the skybridges are the main focus of attention. They were used to transport the products between factory and storage facilities. Their sharp lines are visually very attractive. 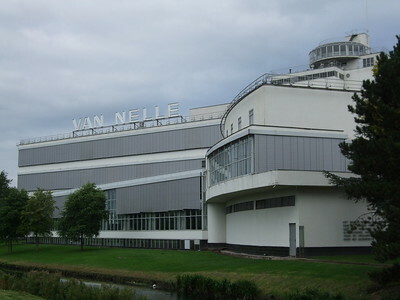 Another notable exterior feature is the display of the name 'Van Nelle' - a clever way of advertising the brand to everyone that passes the building complex which is near a major road and the railway. Fortunately we were allowed to get inside the main building too. Somehow it reminded me of a school. The long hallways, the open views into the rooms, offices and even the toilets. 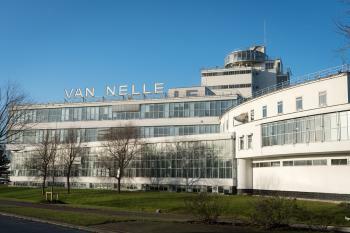 I am not a specialist in (modern) architecture, so it is difficult to say for me if the Van Nelle Factory merits WH status or not. A comparison to the Fagus Factory that got into the List earlier is quite obvious. Both are constructions that were used as factories, and both use the concept of glass 'walls' or 'curtains'. The Fagus Factory is from an earlier generation however. And it is still in use as a factory. Especially that connection is what the Van Nelle Factory lacks - nothing reminds us of the actual tea, coffee and tobacco production, the smells, the working conditions. It is an important work of architecture, that has to get in on that merit alone. My wife and I visited here in August 2017. As it's in use these days as an office building, it's closed to the general public during the week. However, the company urbanguides.nl run tours at 12pm on Saturdays and Sundays, which can be joined for 16 euros per person. Tours last for an hour and can be conducted in English or Dutch, depending on the make-up of the group. We really enjoyed the tour and being able to see inside! Access to the site is easy, either by bike or by direct bus from Rotterdam Centraal. Limited parking is also available on site for an extra charge. See below for my full video review! I visited Van Nellefabriek in January 2017. 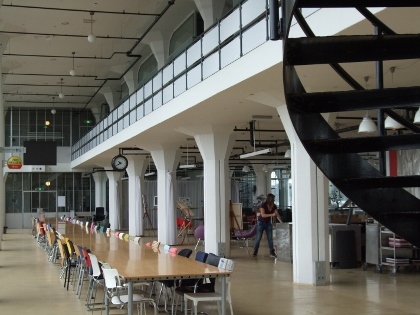 The facility is very easy to get to, located only 4km away from the center of Rotterdam. It can be reached by taxi or by local city bus. The facility is still a working office space, so visitors can't just wander in. There is a guard station at the entrance. You need to go on one of the two days a year it is open to the public, or you need to hire a private tour guide, which is what I did. 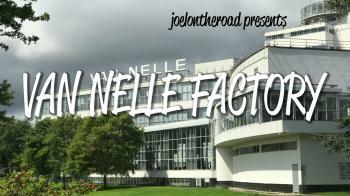 Learn more about Van Nellefabriek at my website. The building itself is very interesting and really very modern and it is really worth to see it but get some background info before getting there! As this site can now be easily visited with a guided tour on the weekends (one tour each on Saturday and Sunday), I decided to extend a long weekend in Belgium with a trip to Rotterdam. You need to register and pay in advance at the Urban Guides site, even though when I showed up, nobody checked the print-out ticket. There were at least 30 people there, and the 2 guides divided them into a Dutch- and an English-speaking group (the latter just a handful of people). The female English-speaking guide was a professional architect who did a good job of explaining the history and the architectural importance of the factory. The tour lasts over an hour and takes you to most parts of the building. The reason why tours only take place on weekends is because there are several companies with offices there, and the city of Rotterdam seems to promote Van Nelle as a workplace again (although they seem to be IT companies and not related to tea, coffee, or tobacco...). All in all, it was an interesting experience and, although I'm not the biggest fan of modern architecture, I think the inscription of the Van Nelle Factory is justified because of its architectural value and as a symbol of trade and commerce. I visited Van Nelle Factory on Day of Architecture (June 20 2015) in Rotterdam. On this day is this unique factory open for the public ! I got free tour for interior. My favorite part of this site is separate upstairs for men and women. This looks like on the one of tentative sites; Zonnestraal in Hilversum. I visited this WHS in February 2015. The Art Rotterdam Fair was scheduled to take place on 5-8 February so I seized this opportunity to visit the interior of the Van Nelle Fabriek while enjoying the fair. Otherwise, the only way to visit the interior is by visiting during the Open Monuments Day (2nd weekend of September), on the National Architecture Day (last weekend of June), or you can reserve a group tour for 100e via Archiguides. I got a discount by booking over the internet and instead of paying an extra 10 euros for parking, I parked my car for free just a few meters away from the factory. It must be said that this WHS is best viewed from the outside to take in its architectural value. The interior is practically empty and only some signs and old machinery remain from the sections dedicated to the tea, coffee and tobacco industries. The highlights of the interior to me were the several "mushroom columns" and tall windows. Strangely enough, the columns reminded me of the Great Hypostyle Hall columns of Karnak. If truth be told though, there isn't much to see inside and the tall windows and columns can be easily seen and appreciated from outside just the same. Should I be anywhere around Rotterdam at night time in the near future, I'll surely make a stop to take a couple of photos as it seems to be much more photogenic at night. 3.0: Els Slots Martina Ruckova Ian Cade Ralf Regele Peter A. 126 Community Members have visited.